There is a long history of bells at Axminster Parish Church, and a well-researched story was published for the 2006 augmentation. Until 1885 there was a ring of six bells with a tenor weighing about 19cwt. In 1885 these were augmented to eight with two bells cast by Mears and Stainbank at Whitechapel, East London. These included the Brocas Bell, the third of that ring, which was cast by William Purdue in 1647 and became “infamous” as its some-time ringer John Brocas was killed in 1839 when he became wrapped in the rope. With the exception of the “Brocas” bell these were recast in 1897 into a substantially heavier eight – the foundry work once again at Whitechapel and the wooden bell frame and fittings by Harry Stokes of Woodbury. In 1950 the bells were re-hung with ball bearings by Gillett & Johnston of Croydon. 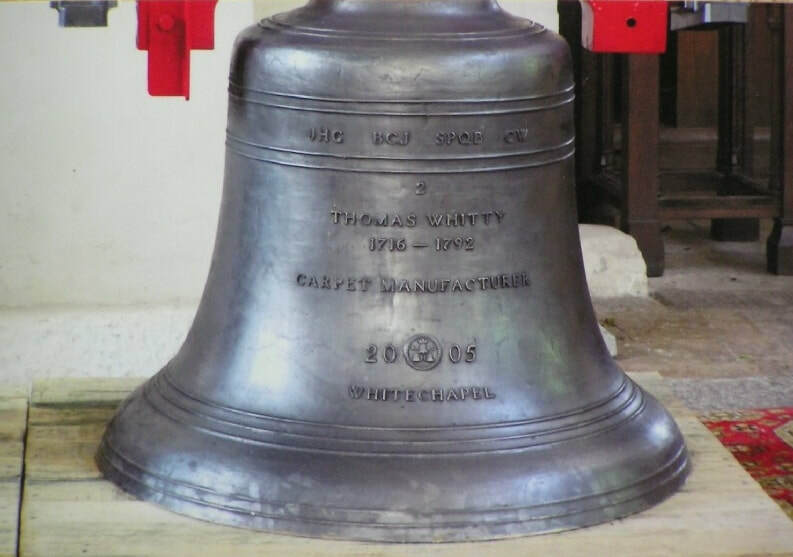 In 1989 the bells were re-tuned and hung with entirely new fittings by the Whitechapel Foundry. The 1989 scheme preserved the beautifully crafted Harry Stokes’ frame and provided additional steel framework to hang the Brocas Bell (now used with electric chiming as a calling bell) and a further two bells. The Millennium was an opportunity to augment to ten bells, but the circumstances of the Parish committed to much restoration of the fabric, walls and windows, took priority. The Golden Jubilee of HM The Queen was another significant opportunity, but a structural report prudently requested by PCC revealed the ringing chamber floor to be in a dangerous condition and the Tower in a poor state of repair. The Parish was committed to an unexpected and major renovation of the Tower, Roof, as well as Clock faces, Flagpole replacement and Ringing Chamber Floor. Huge assistance came from English Heritage and other Charities as well as great local generosity. There was a determination nonetheless to augment to ten bells and the Two Hundred and Fiftieth Anniversary of Thomas Whitty and the founding of the Carpet Industry in Axminster was the focus. 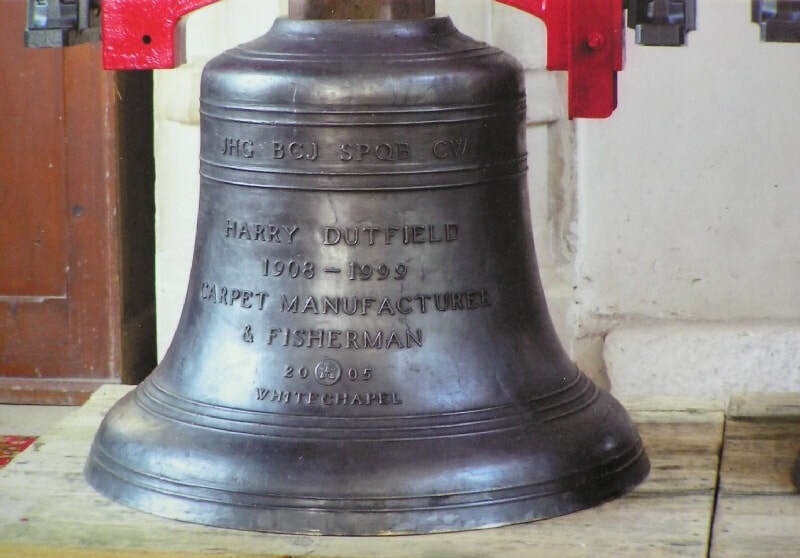 Two bells were funded – a new Treble to honour the memory of Harry Dutfield, founder of the new Axminster Carpets; and a new second honouring Thomas Whitty whose eighteenth century enterprise made Axminster one of the leaders in carpet production. With gifts from the Weavers’ Tales (promoting the Thomas Whitty celebration), Axminster Garden & Crafts Committee, and substantial personal gifts, the project costing some £17,000 was completed in 2006. The two bells were cast, using the same equipment as a century or more ago, at Whitechapel in March 2005 watched by the Tower Captain, Team Rector, and other ringers. They were solemnly consecrated with prayer, chrism, holy water and incense on June 21st by the Bishop of Exeter, Rt. Rev’d Michael Langrish at the Thomas Whitty Celebration. But the bells remained in the nave for several months until the interior work to the tower had been sufficiently completed. They were raised and hung on 13 February 2006 and rung for the first time on 7th April when the new floor was useable, and ready for Easter 16th April 2006. With the work on the tower and the augmentation complete it then emerged that water penetration had damaged a section of the Harry Stokes frame hidden by rubble from past work. The Church Council addressed the issue by removing decayed wood and making good the damage. Visiting bellringers please contact Anne Double (annedouble@hotmail.com ).